If Christianity is the religion of pity then Nietzsche was right about it. But too many persons, including both Nietzsche and Christians, interpret the relation between Christian religion and Nietzschean philosophy too uncharitably. A case in point, recently, is an interpretation suggested by Dan Peterson, a fellow Mormon. "In earlier books Nietzsche had made that most profound announcement: 'God is dead.' In other words, there are no absolute, unconditional, or objective values in the world. Whatever meanings that exist in life are put there by us, by human beings, by 'value-creators.'" Dan suggests an interpretation of the relation between Christian religion and Nietzschean philosophy in two parts. First, Dan appears to suggest that Nietzsche was deluded and evil. He does this primarily by associating Nietzsche with Darwinism and Nazism. Dan describes Nietzsche as "heavily under the influence" of Darwin, as if Darwin were an intoxicant. And Godwin's Law wastes no time. 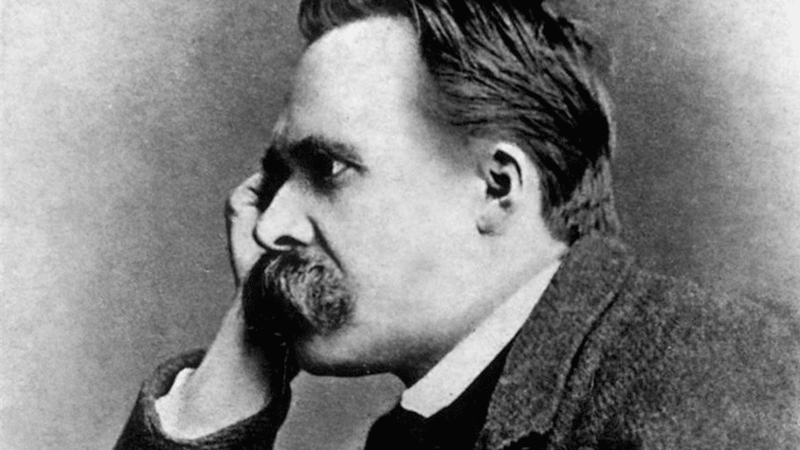 Dan observes that "Nietzsche would have found Nazism and the Nazis repulsive and contemptible." But that doesn't so much absolve Nietzsche as confirm how evil he was because, Dan goes on, "it's not difficult to see why [Nazis] were attracted to at least some of what he said." And finally Dan simply acknowledges that he finds Nietzsche "distasteful" — a euphemism for deluded and evil, apparently. Second, Dan appears to suggest that Christianity is moral absolutism. He does this indirectly, by directing a question about moral non-absolutism to atheists. Dan addresses "those who believe that 'God is dead' (or, less literarily, that God never existed)." Those are atheists. And, Dan reasons, atheism entails that "there are no absolute, unconditional, or objective values in the world and that whatever meanings that exist in life are put there by us, by human beings, by 'value-creators.'" In other words, atheism entails moral non-absolutism, per Dan. And he asks atheists, "Can anything, in a world where there are no objective or absolute values, actually be said to be 'wrong'?" Apparently, Dan doesn't think this question is relevant for theists, or Christians particularly. And, logically, he would be right about that only if Christianity is moral absolutism. Christianity is moral absolutism, and Nietzsche was deluded and evil. So Christian religion and Nietzschean philosophy are irreconcilably opposed to each other. That's my understanding of the interpretation that Dan suggests. And I imagine Nietzsche would have agreed with much or all of that interpretation, even if only to tease Dan. But both Dan and Nietzsche would be wrong. Despite Nietzsche's protestations, Christian religion and Nietzschean philosophy are indeed reconcilable to some substantial extent. And to the extent they are not, they can complement each other, such that they're not merely compatible, but actually have something to add to each other, or to correct in weak interpretations of each other. And I suspect that Nietzsche didn't see it mostly because most Christians didn't see it, so he rightly criticized a popular interpretation of Christianity in his time and place (although I think he sometimes was intentionally provocative in his criticisms of Christianity, even when he could see and sometimes hinted at opportunities for reconciliation). Many books could be written on this subject. Unfortunately, I have time now only for some brief thoughts, inspired by the quotes from Nietzsche that Dan chose. "God is dead"? Well, yes. If God is merely a supernatural superlative, God very well may be dead. Christians, particularly Mormons, who are offended by Nietzsche's declaration are probably privileging a Platonic version of Christianity. That version of Christianity would equivocate between God and the Platonic Good. It would attribute the greatest ontological status to that which is beyond our world, ultimately negating our world. It would marginalize the reality of our bodies and our experience, making them just so many shadows flickering across the back of the philosopher's cave. Such is escapism at best — nihilism at worst. And escapism cannot persist as a living option in any real world. It is not hardy enough. It is not concerned enough. So, when pressed, it changes or dies. Sadly, Christianity has been deeply influenced by such escapism, but that escapism is not inherent in Christianity. Many Christians, notably Mormons, have long advocated an interpretation of Christianity in which our experience matters, our values matter, our bodies matter, and our Earth matters. For such Christians, eternal life isn't a euphemism for death, but rather it's more and better life that's as real as light and as warm as love, in which individual identities persist and participate with God in evaluating the world. For such Christians, resurrection and transfiguration to immortality aren't metaphors or dematerializations, but rather they're changes to physical bodies, still with dynamic parts and passions, but glorified beyond present notions of suffering, aging, or death. And for such Christians, heaven isn't somewhere else far away, but rather it's here on Earth, renewed and glorified. All of these ideas are in the Bible, whether someone's priest emphasized them or not. All of these ideas are genuinely Christian, whether or not Nietzsche would have been able to hear them from a Christian in his time and place. The Platonic God is dead. Eternal life is to know the Living God. "There are no absolute, unconditional, or objective values in the world"? Paul the Apostle may have agreed. Prophecies will fail. Knowledge will vanish away. We are ultimately nothing, unless we have charity, he claims. And charity is love. It's subjective. It's experienced and felt. Otherwise, it's not charity. Now, I think we can and should make the case that objectivity is an abstraction across subjectivity, or a way of trying to share and ever-more-broadly re-share subjectivity. So I think we can save the idea of objectivity from nihilism. But if objectivity is understood as the opposite of subjectivity, or as a negation of subjectivity, then it is indeed ultimately nihilistic. And I'll join Paul in observing that such objectivity will fail and vanish away. And I'll join Nietzsche in declaring that God dead. The alternative is so much better. Jesus summarizes the law and the prophets, perhaps all knowledge and prophecy, even all ethics, in two commands: love God, and love your neighbor as yourself. In doing so, he saves knowledge and prophecy from nihilism, but only by undermining any aspiration to making them unconditional and absolute. After all, he's not talking about the Platonic Good. He's talking about the God like whom we can and should be, "perfect," not as measured by an external rule, but rather as measured by each other through mutual reconciliation — atonement. "Ask what you will of me, and I will do it," he says. "And if you love me, keep my commands." "Whatever meanings that exist in life are put there by us, by human beings, by 'value-creators'"? Yes. As the Bible puts it, humans are created in the image of God. And that is the image of the ultimate value creator. The creator would create more creators, not merely as prosthetic extensions, but rather as genuine creators in their own right. God would create more Gods. "You are Gods." That's what the Hebrew Bible says. And Jesus, reasoning from that, wonders why some people are so offended when he calls himself God's son. The "Son of Man" has power to forgive. The "Son of Man" is Lord of the Sabbath. Who has power to forgive? Who is Lord of the Sabbath? Wouldn't he just use "I" if he were talking about himself exclusively? And of course, it's not hard to make the case that Jesus is never talking about himself exclusively. "[Good is] all that enhances the feeling of power, the Will to Power, and power itself in man"? In Mormon scripture, from The Pearl of Great Price, we read that the work and glory of God is to bring about the immortality and eternal life of humanity. And in The Doctrine and Covenants, we read that God would ultimately make us "equal in power, and in might, and in dominion." Beyond such explicit sanctification of power, the Christian authoritative tradition (both the Bible and beyond) is replete with admonition to become God, like God, as God, or one in God. This is the doctrine of theosis. Some try to marginalize this doctrine by suggesting that humans can't or shouldn't participate in the work, but the scriptures simply don't support such passivity. To the contrary, they repeatedly encourage an active faith that both reverences the grace of opportunity and acts strenuously on that opportunity. "Faith without works is dead," says James. It's not enough to think or talk about feeding the hungry and clothing the naked. We actually have to feed and clothe them. And in James' day, like our own, food and clothing were the products of agricultural and manufacturing technologies. By the grace of God, thanks to power beyond ourselves, we have received power. And now we have an opportunity to use that power as an extension of grace, to participate in the work of God to empower each other further. "[Bad is] all that proceeds from weakness"? Some will be tempted to think that Nietzsche means that everything that comes after weakness is bad. But that would be a poor interpretation of his ideas on the whole. Nietzsche claimed that superhumanity would proceed from humanity, and he considered humanity to be weak compared to superhumanity. He celebrated superhumanity, and surely would not have intended it to be understood as bad in any simplistic sense — although I can imagine him acknowledging that some (maybe most or all) humans would be offended by superhumanity, its values and re-evaluation of values, and consider it bad in a complex sense (resonant with the Christian idea that divine matters can be offensive to those who are not ready for them). Moreover, Nietzsche claimed elsewhere that humanity is a preparation for superhumanity. So, in at least one important sense, good proceeds from weakness. And this is the sense in which Christianity also rightly celebrates weakness. Paul the Apostle celebrates weakness and suffering because of the strength they cultivate in him. And The Book of Mormon makes the principle explicit: "I give unto men weakness that they may be humble; and my grace is sufficient for all men that humble themselves before me; for if they humble themselves before me, and have faith in me, then will I make weak things become strong unto them." So the point is not weakness. The point is strength. But when we're arrogant, we're unable to make the changes we need to become strong. We're unable to make the changes we need to become God, as described in the Mormon tradition. Or, as Nietzsche would perhaps have put it, when we're arrogant, we persist with burdens that prevent us from transformation into superhumanity. Thus, arrogance is a weakness. Superhumanity cannot proceed from it. Godhood cannot proceed from it. Or, as The Book of Mormon puts it, "the natural man is an enemy to God." Bad is all that insists on weakness, that is satisfied with itself merely as it is, that doesn't seek to love beyond itself to neighbor, to become beyond itself to Godhood. "[Happiness is] the feeling that power is increasing — that resistance has been overcome." Elaborating on principles from the Bible, The Book of Mormon teaches that humanity exists that it might have joy. Joseph Smith taught that happiness is the object and design of existence. And Mormon scripture teaches that joy results from fulfilling and reconciling desires. I won't elaborate much on this here, as I've already written on this at some length elsewhere. But I'll point out that Mormon scripture strongly associates the fullness of joy with physical embodied immortality, as an essential characteristic of Godhood. And it describes death, both physical and spiritual, as an "awful monster." That resonates with Paul's prophecy in the New Testament that death will ultimately be vanquished. And all of this sounds, to me, a lot like the feeling of power increasing and resistance being overcome, in truly the most consequential ways. "Not contentment, but more power"? Right. As God is depicted in Mormon scripture, Godhood is not about contentment. God weeps in heaven. God is not content because the children of God are undermining the work to cultivate their Godhood. As depicted in the Bible, Jesus weeps on Earth. A friend died. Other friends lost hope. But the stories do not end there. And they do not end in contentment. Indeed, particularly as interpreted in the Mormon tradition, the stories never end. The work of creation, with real risk and real reward, requiring real courage and compassion, is eternal in worlds without end. Godhood is not about contentment. Godhood is about power and its perpetual expansion through individuals and communities. As Paul puts it, "the Spirit God gave us does not make us timid, but gives us power, love and self-discipline." "Not peace at any price, but war"? Jesus says as much, that he would bring a sword. Some things are worse than death. Some prices are too great for peace. Sometimes we must fight. The greatest monsters are death and sin, and the ultimate victories are immortality and eternal life. Peace with mortality and suffering at any price? No, thanks. "Not virtue, but efficiency"? Virtue ethics, static laws, can be and probably generally are useful. But they have their limits. In the Bible, God commands or condones breaking each of the Ten Commandments at one time or another. Joseph Smith observed that God, at one time, commanded "thou shalt not kill", and at another time, "thou shalt utterly destroy." He concluded from that: whatever God commands is right, even if we don't immediately understand the reason. Implicit in all of this is the notion that some things are more important than ethical formulas or static virtues. Implicit in all of this is the notion that God would go further than any dogma to forward the work of immortality and eternal life. As The Doctrine and Covenants describes it, God is quite willing to try whatever may work, to both positive and negative extremes. None of this is to say there's not a certain virtue in the goal toward which efficiency is aimed. Christians might call that virtue "Godhood." Nietzsche might call that virtue "superhumanity." But to the extent that any particular ethical formula inhibits progress toward that goal, properly understood as holistic and altruistic in scope, it should be superceded. As the Mormon Articles of Faith put it, God "will yet reveal many great and important things." If virtue ethics were sufficient, what would be the point of ongoing contextual revelation? "The weak and the botched shall perish: first principle of our humanity. And they ought even to be helped to perish." Some are shocked by how Nietzsche says this, and such provocation was surely one of his goals. But note that he did not encourage killing. That wasn't an accident. Nietzsche clearly and repeatedly claimed that humanity, our human nature, is something that we should overcome in pursuit of superhumanity. That's probably the most accurate and at least the most charitable interpretation of the intent of these words. And it's hypocritical for Christians to exaggerate indignation in response. After all, Jesus himself says, "Whoever wants to be my disciple must deny themselves and take up their cross daily and follow me. For whoever wants to save their life will lose it, but whoever loses their life for me will save it." And Paul follows up, bluntly, "I have been crucified with Christ and I no longer live, but Christ lives in me." The Bible and early Christians were no strangers to provocative language aimed at inciting strenuous pursuit of human transformation. Of course many have interpreted Nietzsche dangerously, horribly even, and used his words as admonitions to violence. But Christianity is no stranger to such dangers. Many have abused the provocative language in Christian rhetoric, some even attempting to justify major atrocities in human history. And unlike Nietzsche, Christianity must actually deal with explicit admonitions to violence and even genocide in its holy text. "What is more harmful than any vice? Practical sympathy with all the botched and the weak," writes Nietzsche. This too may lend itself to dangerous or unethical interpretations. But consider the sentence and its context carefully. In the previous sentence, Nietzsche encourages helping the weak to perish. Where there is no form of sympathy, there is no admonition to help. So, to remain coherent, he must be advocating at least some form of sympathy. And, in this next sentence, as translated, Nietzsche is not criticizing just any arbitrary form of what we might call "sympathy." Rather, it is qualified as "practical sympathy." I'm not a German scholar, and perhaps one will weigh in for me. But my interpretation, in light of the previous sentence, is that practical sympathy with weakness would be something like speaking or acting so as to perpetuate weakness and cultivate dependency. If my interpretation reasonably approximates Nietzsche's intent then his intent is altogether consistent with Christian theology, particularly as characterized in Mormonism. Joseph Smith taught that God, "finding he was in the midst of spirits and glory, because he was more intelligent, saw proper to institute laws whereby the rest could have a privilege to advance like himself." And as Mormon scripture characterizes it, God's goal of human progress requires human agency in a context with real risk of serious suffering. Without agency, there's no purposeful existence. Without real risk, there's no meaningful agency. And consider experience itself. It seems abundantly clear that, if God exists and created our world as I trust to be the case, God is not interested in coddling us in our weakness. We experience and observe far too much suffering to trust in a coddling God. Our world is logically incompatible with a coddling creator -- unless the creator is altogether incompetent, which seems precluded by attribution of the title, "God." Nietzsche continues, "Christianity is called the religion of pity. ... People have dared to call pity a virtue ... people went still further, they exalted it to the virtue, the root and origin of all virtues." He, or whoever he's quoting, is wrong about this. And many Christians are wrong about this. Christianity is the religion of charity. But charity is not pity. They are distinct in both intent and consequence. Pity is an arrogant disposition, resigned to one's own or another's inferiority (yes, even self-pity is arrogant, and perhaps especially arrogant), and inclined to acts that perpetuate weakness and cultivate dependency. Pity is sin. In contrast, charity is a humble disposition, hopeful for everyone's (including one's own) empowerment, no matter how hard it is or how long it takes. Charity is love, probably best characterized by Paul in the New Testament: "Love is patient, love is kind. It does not envy, it does not boast, it is not proud. It does not dishonor others, it is not self-seeking, it is not easily angered, it keeps no record of wrongs. Love does not delight in evil but rejoices with the truth. It always protects, always trusts, always hopes, always perseveres. Love never fails." Nietzsche writes, "Pity is opposed to the tonic passions which enhance the energy of the feeling of life: its action is depressing." He's right, if pity is a pessimistic attitude toward the potential of one's self or others. That is indeed depressing, both emotionally and in consequence. In contrast, Paul describes charity as that which "so powerfully works in me," to such extent that he actually rejoices in his suffering for others. Clearly, at an experiential level, Nietzsche and Paul are not talking about the same phenomenon. Pity is not charity. Nietzsche writes, "A man loses power when he pities. By means of pity the drain on strength which suffering itself already introduces into the world is multiplied a thousandfold. Through pity, suffering itself becomes infectious; in certain circumstances it may lead to a total loss of life and vital energy." He's right. Not only does pity require one's time, and not only does practical application of pity require one's resources, but pity also uses time and resources in ways that have a high likelihood of becoming dead ends. Because pity is administered without esteem for the recipient's potential, it's ultimately a power drain all around, even if it seems to help someone for a short period of time. In contrast, charity concerns itself not merely or arbitrarily with giving time and resources, but with doing so in a way that actually empowers persons over the long run. More than mere spending of power, charity is an investment of power. Some Christians have suggested that the crucifixion of Jesus demonstrates pity for humanity, simply giving everything without any expectation in return. But that's not what the Bible teaches. To the contrary, Paul claims, "For the joy set before him [Jesus] endured the cross." And Paul extends that to all of us, "heirs of God and co-heirs with Christ, if indeed we share in his sufferings in order that we may also share in his glory." Thus, the Bible teaches enduring and relieving suffering for the purpose of joy in shared glory. It certainly does not advocate the cultivation of suffering, despite the many Christians who have engaged in various forms of self-flagellation (literally or figuratively) that merit Nietzsche's criticism. And finally, Nietzsche writes, "On the whole, pity thwarts the law of development which is the law of selection. It preserves that which is ripe for death, it fights in favor of the disinherited and the condemned of life; thanks to the multitude of abortions of all kinds which it maintains in life, it lends life itself a sombre and questionable aspect." The error here is not Nietzsche's appeal to the grim constraints of reality -- "Darwinism," if you will. Judging from Mormon scriptures, physical and logical constraints would apply even to the greatest heavens of the Gods, who operate according to law and seek to cultivate human progress according to law. And again, the error is not Nietzsche's insistence that weakness should perish, as explored above. The error, rather, is in an exceptional instance of hypocrisy. Nietzsche hopes and yearns for superhumanity. We might even say, using language similar to that of Jesus, that Nietzsche loves superhumanity with all of his heart, mind, and strength, and that he loves others as himself only in context of that greater love. But he still doesn't love superhumanity enough. He doesn't love superhumanity with all of OUR heart, mind, and strength. Nietzsche's allegorical prophet, Zarathustra, identifies fellow-suffering as his last temptation. When higher humanity is finally gathered to him, re-evaluating all values together, he's tempted to linger with them. But he does not. Instead, as he supposes, he transcends even the highest of friends. And he finds himself back at the beginning. There, he re-affirms life again and again, to be sure. But it is, admittedly, the life of repetition. What will happen when Zarathustra embraces his friends with a vow to be true to each other, in an eternal sealing that would be stronger than the bands of death? What will happen when that community endures suffering together as they re-evaluate all values according to their ever-dynamic desires in infinite and eternal reconciliation? What will happen when Zarathustra puts his last weakness on the cross? What will happen when Zarathustra practices atonement? I don't know for sure, but I have imagined no greater power.